Ukraine’s economy is highly sensitive to world economic trends. Movements of world prices on commodities like metals, raw oil or chemicals as well as capital flow reversals have a significant impact on domestic economic trends. This sensitivity was demonstrated in 2005 that changes on world metal market resulted in sharp reduction of exports causing significant deceleration of Ukraine’s real GDP growth. The story repeated in 2008 when a swift change in world economic conjuncture and financial markets turmoil were among major causes of the economic crisis in the country. The real GDP dropped by about 15% in 2009, being one of the largest reductions among European countries. However, major reasons for concern are not external shocks but domestic imbalances. Domestic problems aggravated before the crisis included unfinished institutional reforms, financial gaps in fiscal and social security systems, overheated consumer market, and large shadow economy. During the crisis some of these problems have accumulated further. In particular, fiscal situation became very difficult causing rapid accumulation of public debt. Gradual recovery of the world economy helped to drag the Ukrainian economy out of the crisis. The real GDP returned to growth pace and increased by over 4% in 2010 supported initially by exports and later on – by domestic demand recovery. The economy is expected to continue growing at moderate pace also in 2011. To accelerate economic development, in mid-2010 the President and the Government announced ambitious reform plan and started to implement it. So far reforms have been uncompleted. In this article, we review several economic issues in Ukraine that we consider among the most important for understanding economic situation in the country. The economic crisis in Ukraine revealed that fiscal policy should be changed if the country wants to return to sustainable economic growth path. The sudden drop in economic activities in the end of 2008 and in 2009 resulted in decline of fiscal revenues. At the same time, high recurrent expenditures did not allow the Government to cut fiscal spending, which resulted in fiscal deficit estimated at 8.7% of GDP in 2009. As a result, fiscal consolidation became a major focus in the Stand-by Agreement signed between the IMF and Ukraine. The Government has started fiscal reforms in 2010 and is planning to return to sustainable fiscal policies in several years. Fiscal reforms. In 2010 the Government initiated fiscal reforms. As a result, the Parliament approved the Tax Code and new version of the Budget Code. Budget Code: In July 2010, the Parliament approved new version of the Budget Code. The document envisaged the introduction of the medium term expenditure framework (MTEF) as well as implementation of the program targeting method of elaboration and execution of central and local budgets. Besides, the coverage of fiscal issues regulated by the Code was enlarged. In particular, the document now includes definition of protected spending items, which previously were defined in each Budget Law. The Code now defines the clear grounds for granting investment subsidies to local budgets from the central coffers. At the same time, as previously, the Code does not define the marginal size of the deficit. One of the declared goals of the document was to increase fiscal decentralisation through providing local governments with higher autonomy and better opportunities to raise own financing. Local governments received additional sources of revenues in the form of part of payment for certain types of licenses and certificates, state registration, fraction of duty on water usage, etc. However, in December, the fiscal autonomy of local governments was reduced. Initially the local governments were also granted the right to set additional EPT rate, which was due to local budgets for financing capital outlays. However, as this provision was not reflected in the Tax Code, it was eliminated from the Budget Code in the end of 2010. As a result, local budgets did not receive significant additional source of financing capital spending. The amendment to the Budget Code made in December 2010 also endangered fiscal position of Kyiv. Starting 2011, 50% of personal income tax (PIT) paid in Kyiv, which is one of the largest sources of local fiscal revenues is to be transferred to central budget. The Budget Code increased the role of the Government in the budget process. In Particular, Budget Resolution is now substituted by the Budget Declaration, which is to be prepared by the Government and its approval by the Parliament is not envisaged. The Cabinet of Ministers has also received more rights in defining investment programs to be financed from the State Budget as well as in the field of borrowing. Therefore, new version of the Budget Code could be considered as a step forward budget reform, but not a complete reform. The local budgets have received potential for increase in revenues and clearer rules. However, December amendments have again endangered position of local governmental entities. Tax Code: The approval of the Tax Code was one of the hottest topics for discussion in the second half of 2010. The first draft of the Tax Code was elaborated by the Government rather quickly. It was submitted to the Parliament on June 15 and approved in the first reading two days later. The text of the document combined more than 20 legislative acts on taxation issues, eliminating their controversial provisions. However, it resulted in opposition of many tax payers as it envisaged increase in competences of tax authorities and de factor liquidation of the simplified taxation system (STS)  for B2B services providers. In particular, tax administration has received more powers in conducting off-scheduled inspections. After public hearings conducted in many regions, the document was recalled by the Government in early September. New version of the Tax Code, which was submitted to the Parliament on September and approved in the second reading in November, has somewhat reduced competences of the tax administration, which has still remained large. However, the document still envisaged de facto liquidation of the STS, which resulted in strikes of small entrepreneurs and finally in the Presidential veto. The finally approved version of the Tax Code does not contain the chapter on the simplified taxation system, which is to be elaborated later in 2011. Overall, the Tax Code became effective since 2011, while the chapter on the EPT was enforced starting April 2011. According to the approved Tax Code the enterprise profit tax (EPT) rate declined from 25% in 2010 to 23% in 2011 and then will gradually decrease to 16% in 2014. The number of differences between commercial and tax accounting substantially declined, which makes accounting and reporting easier. The depreciation rules will become closer to the EU norms. However, further improvement are needed. In particular, while there are defined 16 groups of fixed assets, most assets fall under four groups. Even though, the Government remained unchanged STS, the Tax Code stipulates that legal entities working under general taxation system cannot deduct payment to STS taxpayers (except for IT services) from profit subject to EPT. Therefore, legal entities are de facto discouraged to work with the STS taxpayers. At the same time, the Tax Code envisages zero EPT rate for small new-starters for five years. Companies of light industry, hotels and restaurants will enjoy 10-year EPT-break. Such privileges do not seem to be substantially economically justified. The VAT rate will be reduced from 20% to 17% in 2014. Taxpayers with good tax record are promised to receive VAT refunds automatically. The VAT rules for agricultural sector were changed. The PIT rate will become slightly progressive with base rate at 15%, while 17% will be paid on incomes over 10 sizes of minimum wage. At the same time, the Government postponed taxation of deposit interest until 2015. Several local taxes and duties were eliminated due to their inefficiency. At the same time, property tax is to be introduced in 2012. However, for efficient introduction of this tax the Government has to conduct substantial work in 2011. In particular, clear property registry is to be formed. Overall, the approval of the Tax Code was a first step forward tax reform. Most provisions remained similar to old regulations. The Code is mostly fiscal document, which does not suggest additional incentives for economic development. It is likely that it will allow Ukraine to go upwards in the Doing Business rating due to declined number of local taxes, lowered tax rates, and reduced number of legislative acts to be dealt with while paying taxes in Ukraine. However, it might increase pressure from the tax authorities, which would negatively impact investment climate. As the Tax Code was elaborated and approved very quickly, it contains many failures. As a result, the Government and the Parliament continues efforts to streamline tax legislation by amending the Tax Code. Besides, the Government and people deputies work on the elaboration of the chapter on the STS, which would enable micro business working further while reducing distortions created by this taxation scheme. Therefore, the work on the Tax Code will still last in 2011, which means that business should still only hope for stable and fair taxation regulation. In Ukraine the budget process is not an easy one. In particular, the country entered the fiscal year 2010 without approved budget due to political tensions explained by the Presidential elections in the first two months of 2010. The State Budget Law was finally approved in April 2011 with a violations of provisions of the Budget Code. The Law envisaged very optimistic plan of revenues, which resulted in budget sequester already in the beginning of July. Still, fiscal pressure remained high during entire years. Consolidated fiscal revenues grew by only 8.9% as compared with 2009 being at 31.5% of GDP. At the same time, the Government could not significantly restrict fiscal expenditures growth as social standards were increased sharply. Therefore, the consolidated fiscal deficit remained high at 5.9% of GDP, which was mostly financed at the expense of soared state debt. Total – direct plus guaranteed – debt is estimated to increase by 35% in 2010 to UAH 432 bn (USD 54 bn). In relation to GDP it is expected to reach 39.5% in the end of 2010 as compared to 12.3% in the end of 2007 and 20.0% in the end of 2008. Even though the debt remained moderate by international standards, the risk of fiscal sustainability intensified. The State Budget Law for 2011 was approved in December 2011. It was based on the provisions of the Tax Code and new Budget Code. The Law is different from many of its predecessors due to major two factors. First, planned fiscal parameters as well as macroeconomic forecast they are based on are perceived as realistic. Second, the document foresees growth of social standards in line with inflation, while before these standards were raised sharply each year. Limited spending growth against the background of higher revenues is officially expected to enable the Government to cut the fiscal deficit to 3.1% of GDP. The beginning of the fiscal year 2011 was encouraging. Contrary to previous years the Government gas started year with large financing accumulated at the Unified treasury account. The fiscal revenues were slightly over-executed in the first two months of 2011, being supported by economic recovery and better tax administration. However, the business complains about extensive pressure on the side of tax inspectors, which might hamper economic activity in the future. Even though the revenues were executed in full and the Government was successful in attracting domestic and external borrowings, all articles of fiscal expenditures (by functional classification) were not executed, which resulted in positive fiscal balance between January and February. Therefore, during following months the Government should start better financing its functions. One of the largest reasons for unsustainable fiscal policy in Ukraine is a pension system, which generates severe deficits covered at the expense of transfer from the Central budget. In 2010, the Pension Fund’s deficit amounted to 2.4% of GDP. Consequently, the pension system is to a large extent responsible for the strained fiscal situation in the country. Reform of the pension system is indispensable to reinstall fiscal stability and to stabilize state debt. In 2003 Ukraine embarked on a comprehensive pension reform, which became necessary due to country’s unfavourable demographic development with a fast aging and declining population. The major goal of the reforms was financial consolidation of the pension system. The existing solidarity pillar – a compulsory PAYG pension insurance – was to be reformed and complemented with compulsory individually funded second pillar and voluntary (private) third pillar of non-state pension insurance. While the third pillar went into operation in 2004 the introduction of the second pillar was postponed for several times due to deficit of the Pension Fund. The positive feature of the reform was the introduction of formula-based calculation of pension, which depended on insurance record. However, major drawbacks and failures of the pension system remained. These are early retirement (55 years old for women and 60 years old for men), extensive privileged pensions, narrow contribution base. At the same time, pension contribution rates remained high, which resulted in high share of wages paid in shadow. These drawbacks combined with sharp increase in minimum pensions, which far exceeded the pace of minimum wage growth, resulted in severe deficits of the Pension Fund. Rapid increase in pensions resulted in surge of the Fund’s expenditures to 18% of GDP, which is the highest level in the region. 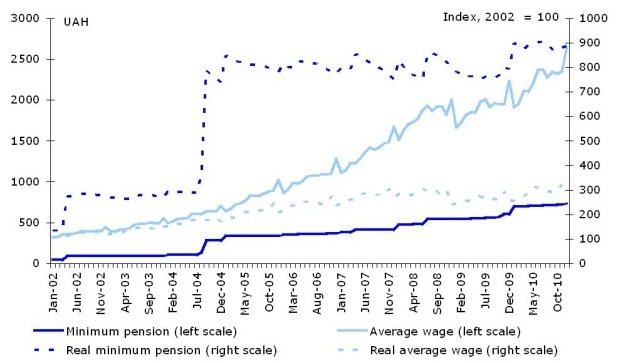 At the same time, average pension remains low being close to the minimum one. In 2009 the pension system appeared to be highly unsustainable against the background of shrank contribution base and increased pensions. The central fiscal transfer to the Pension Fund accounted for 20% of total central fiscal expenditures. The reported Fund’s deficit reached 1.5% of GDP; while de facto it was at 3.4% of GDP being mainly financed at the expense of loans provided by the State Treasury. ** Starting 2005 the Pension Fund receives transfer for paying pensions to retired militaries. In 2010, further rapid increases in minimum pensions did not allowed the Pension Fund to improve the financial situation. The deficit financing central fiscal transfer reached UAH 26.6 bn, while total transfer was at UAH 64.1 bn (21.1% of total central fiscal expenditures). Own Fund’s revenues were under-executed, which resulted in additional accumulation of the Treasury loans. The total deficit of the Pension Fund is estimated at UAH 34.6 bn. The non-sustainability of the pension system and unfavorable demographic trends (characterized by ageing and declining population) urge the Government for immediate steps towards pension reform. Streamlining of generous special pensions. In principle, the IMF, the World Bank and many other experts stressed for importance of these steps for a long time. In particular, retirement age for women at 55 years old is the lowest in the region, while life expectancy of women at retirement age is among the highest. The compulsory contribution period for receiving at least minimum pension remains low at 20 for women and 30 for men is also considered to be low. At the same time, privileged pensions to different occupational groups are high requiring extensive financing from the State Budget (3.4% of GDP in 2010). Therefore, these reform steps should be introduced. However, the elaborate draft law does not foresee any stimulus for people to contribute more and longer to the system. The investment into PAYG pension system in Ukraine is estimated to be a bad investment, while pension contributions remain high. Most pensioners receive pensions, which are close to the minimum pensions. However, the Government currently does not plan to increase the differentiation of pensions. Besides, the labour market remains weak and cannot absorb higher number of economic active population. Thus, the broader policies are needed in the framework of pension reform than just those aimed at increasing contribution base. For many years the assets of infrastructure sectors of Ukraine have been exhausting. According to information provided by the State Statistical Service of Ukraine, dilapidation of fixed assets in the area of generation and distribution of electricity, gas and water exceeded 62% in 2009, and dilapidation of fixed assets in transport and communication sector reached almost 84%. Moreover, the trend is negative, the dilapidation has aggravated over the last decade. Production output growth before the crisis exerted considerable pressure on the national infrastructure, increasing the risk of major accidents (prolonged disruptions of power, water and heat supply, transport accidents). This, in turn, could lead to massive economic losses, reducing fiscal revenues and raising fiscal expenditures at all levels. Thus, the need for reform is hard to underestimate. A lot of efforts have been made to develop strategies of reforms in the infrastructure, however few has been implemented. At the moment, according to the Infrastructure Monitoring of Ukraine power sector and telecommunications are the most reformed and developed sectors. These sectors are characterized by considerable private ownership, competitiveness and market oriented regulation. The next come roads, gas and railways. These sectors are monopolized by state companies and bring a lot of cash to the state. However, lately financial performance of the sectors has been catastrophically worsened. Public utilities sector is the least developed one because little changes have been made to its organization and management. However in 2010 important steps forward to more market oriented organization of the sector were made. Recently a lot of efforts have been made to improve legislation. The very last achievements were adoption of the market oriented Law on Functioning of The Gas Market, creation of a National regulator for public utilities, and fixing the activities of the existing regulator in gas and electricity sectors by a law. Also tariffs for most infrastructure services for all types of consumers were increased improving the cost coverage of the tariffs and financial performance of the services providers. 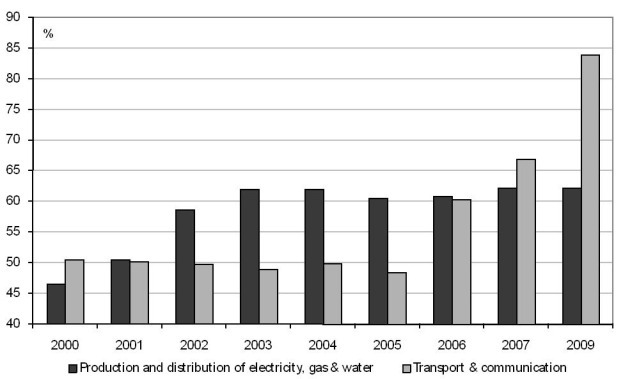 Transport infrastructure - railways and roads – performs badly lately. The main reason is bad financial performance of the monopolists – Ukrzaliznytsia and Ukravtodor. Both have excessive loan burdens, high payments to the state budget and lack of funds for proper maintenance and investments into their assets. The government interferes into performance of the monopolists, blocks them from using economic instruments to improve their efficiency. Basically, the activities of the monopolists are not market but fiscal oriented. Unfortunately, the latter approach exhausts transport infrastructure of the country, which will lead to much higher costs of its rehabilitation in future, high losses from loosing competitiveness in transit and overall economic growth losses. Important development in the public utilities sector was observed last year. An independent regulator for public utilities – National Regulatory Commission for Public Utility Markets of Ukraine – has been established. The Commission is aimed to balance interests of stakeholders on the market by setting tariffs for heating, water supply and wastewater treatment services, licensing and controlling compliance with licenses conditions. Thus, tariff-setting function is taken from the local authorities and transferred to the national level, which, in principle, diminishes political interference into tariff setting. It is also expected that cost coverage of utilities tariffs will improve, which in turn will improve financial state of the enterprises of the industry. At the same time, the Law on the Commission has several important drawbacks. First, there is not enough human and financial capacity envisaged to perform appropriate tariff assessment and following tariff setting. Second, there is no procedure of assessment of tariffs envisaged, which mean that, at least at the first stage, the commission is not going to check economic sense of the tariffs. Third, the regulation framework does not foresee incentives for investors to earn money by using saving instruments. Thus, there is a good chance that the instrument of independent regulation will be highly underutilized. The Commission should have begun its operations from January 2011 however it is still not active. Unfortunately it seems that in Ukraine reforms in infrastructure sectors are only possible when it is no room for not reforming the sectors. Shocks – external (gas price) or domestic (fiscal deficit) – help government to dare for reforms. Assessments of business environment by entrepreneurs have been traditionally used to monitor the success of reform process in the country in terms of creating enabling economic environment. Several research organisations conduct surveys of entrepreneurs to develop a business climate assessment in Ukraine. The Quarterly Enterprise Survey by the Institute for Economic Research and Policy Consulting (IER) is the oldest one. The survey uses the business tendency surveys method designed by the IFO, a Munich-based institute. 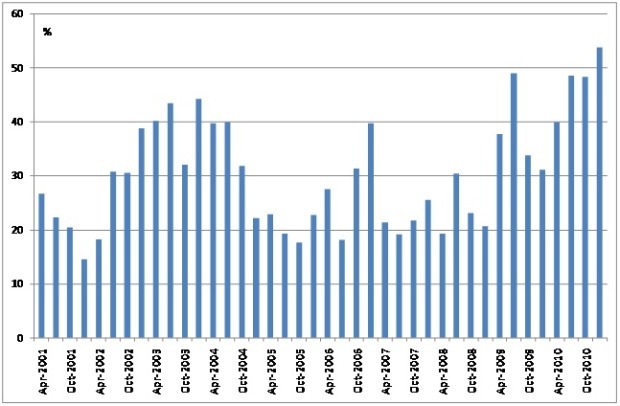 According to the surveys, variations in the estimates of the current business climate quality in the country were insignificant from 2003 until the onset of the economic crisis. The assessment has always been rather pessimistic. The number of enterprise managers talking about an improved business climate steadily remained lower than those enterprises concerned about the difficulty of the business climate in the country. However, the situation deteriorated sharply as the crisis worsened. The balance of business expectations fell abruptly in the fourth quarter of 2008, reaching its lowest level since 1999 by January 2009 (-0.56). There had been a substantial improvement in the assessment of the economic situation and the business climate in the country only by the third quarter of 2009 when the recovery of external demand and, accordingly, domestic industrial production began. In 2010, the assessment of the current quality of business climate by enterprise managers declined again, to -0.36 in January and to -0.34 in July, deterioration after the optimism recorded in the latter part of 2009. It was probably caused by the lack of fast progress both in restoration of external and domestic demand and with economic reforms to foster entrepreneurial activity in the country. The assessment was slightly better in end of the year and in January 2011 (around -0.20), however pessimism still dominated. 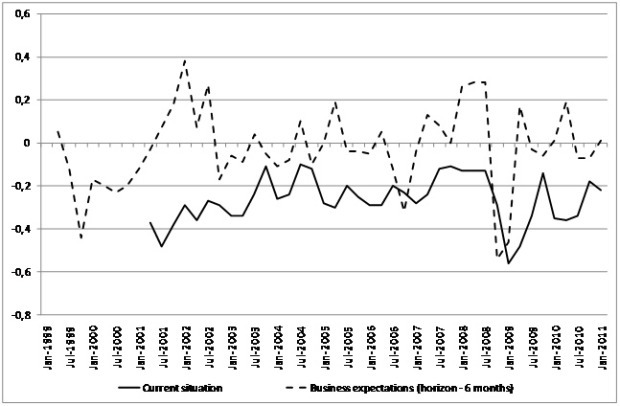 The value of the index of business expectations increased 0.01 in early 2011, thus returning to January 2010 level. However, the majority of entrepreneurs remained sceptical and do not expect changes over next months. According to the July 2010 survey data, the greatest obstacles to the growth of production were low demand (63.9%) and excessive taxation (60.2%) (Table 1). However, in early 2011 the situation changed. Against the background of Due to introduction of Tax Code, excessive taxation was named as significant obstacle by lesser number of managers (49.8%). At the same time, importance of unfavourable regulatory climate as major obstacle for entrepreneurs increased. The indicator of the unfavourable regulatory climate shown in Table 1 is a compound indicator consisting of three indicators – high regulatory pressure, corruption, and frequent changes in economic legislation. The worsening economic situation in the country exacerbated entrepreneurs’ perception of the regulatory climate as unfavourable. When the economy was growing strongly, most entrepreneurs placed relatively low importance on the unfavourable regulatory environment, but the acute deterioration in economic conditions and the fall in demand emphasized the significance of these regulatory problems to producers. In July 2007, when the global crisis was only commencing in the U.S. mortgage market, only 19.2% of enterprises identified the unfavourable regulatory environment as a obstacle to growth, but the percentage rose to 30.4% in July 2008 and then to 49.0% and 48.5% in July 2009 and July 2010, respectively. By early 2011, 53.7% of surveyed managers consider the regulatory environment as unfavourable. All the three components of the index - high regulatory pressure, changes in economic legislation, and corruption, were perceived as greater problems. The greatest problems, from the managers’ point of view, are generated by the high regulatory pressure, indicated as an obstacle by 36.5% of managers in July 2010 and by 40.4% of manages in January 2011, despite launched deregulation reform. Changes in economic legislation have created additional problems for manages over 2010. In July 2011, 15.7% of managers considered this factor as a problem, and by January 2011 this figure reached 17.8%. Summing up, results of managers survey once again confirm that launched reforms in Ukraine has been far from completion, and in the meantime business has been suffering from increased regulatory pressure and from uncertainty produced by legislative changes. Meaningful assessment whether launched reforms are successful in changing the pace of Ukraine’s economic development and solving fiscal problems of the country will be possible in the end of 2011 or early 2012. By then, reforms should start bearing fruits. Consolidated fiscal revenues (expenditures) include Central and local fiscal revenues (expenditures). The revenues (expenditures) of social security funds are excluded, as they are extra-budgetary funds. The revenues of the Pension Fund and other social security funds are accumulated at special accounts at the State Treasury and are not part of fiscal revenues. The only source of financing the Pension Fund’s deficit is a central fiscal transfer. See Policy papers V9 and PP/01/2011 of the IER and GAG. The Draft Law “On legislative measures to support pension reform”, No. 7455, submitted on December 13, 2010. There are more than 500 district heating companies and more than 1000 water companies in Ukraine the tariffs for services of which are going to be set by the commission. To do that one need significant human as well as financial resources. Neither of that is foreseen. For the reference UK's water regulator performs tariff regulation for about 30 companies with 200 people of staff and app GPB 18 ml a year budget.